"Hero engine" redirects here. For the game engine and server technology platform, see HeroEngine. The aeolipile Hero described is considered to be the first recorded steam engine or reaction steam turbine. The name – derived from the Greek word Αἴολος and Latin word pila – translates to "the ball of Aeolus", Aeolus being the Greek god of the air and wind. 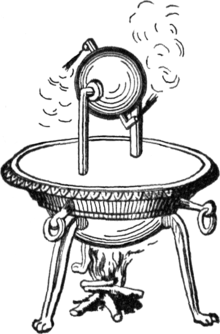 Pre-dating Heron's writings, a device called an aeolipile was described in the 1st century BC by Vitruvius in his treatise De architectura; however, it is unclear if it is the same device or a predecessor, as he does not mention rotating parts. 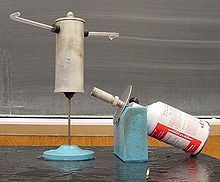 The aeolipile consists of a vessel, usually a "simple" solid of revolution, such as a sphere or a cylinder, arranged to rotate on its axis, having oppositely bent or curved nozzles projecting from it (tipjets). When the vessel is pressurised with steam, steam is expelled through the nozzles, which generates thrust due to the rocket principle as a consequence of the 2nd and 3rd of Newton's laws of motion. When the nozzles, pointing in different directions, produce forces along different lines of action perpendicular to the axis of the bearings, the thrusts combine to result in a rotational moment (mechanical couple), or torque, causing the vessel to spin about its axis. Aerodynamic drag and frictional forces in the bearings build up quickly with increasing rotational speed (rpm) and consume the accelerating torque, eventually cancelling it and achieving a steady state speed. 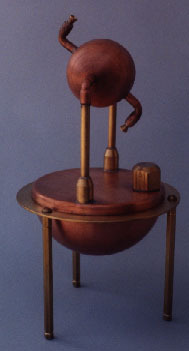 Typically, and as Hero described the device, the water is heated in a simple boiler which forms part of a stand for the rotating vessel. Where this is the case, the boiler is connected to the rotating chamber by a pair of pipes that also serve as the pivots for the chamber. Alternatively the rotating chamber may itself serve as the boiler, and this arrangement greatly simplifies the pivot/bearing arrangements, as they then do not need to pass steam. This can be seen in the illustration of a classroom model shown here. Both Heron and Vitruvius draw on the much earlier work by Ctesibius (285–222 BC), Ctesibius or Ktesibios or Tesibius was an inventor and mathematician in Alexandria, Ptolemaic Egypt. He wrote the first treatises on the science of compressed air and its uses in pumps. Æolipylæ are hollow brazen vessels, which have an opening or mouth of small size, by means of which they can be filled with water. Prior to the water being heated over the fire, but little wind is emitted. As soon, however, as the water begins to boil, a violent wind issues forth. a scientific invention [to] discover a divine truth lurking in the laws of the heavens. Thus from this slight and very short experiment we may understand and judge the mighty and wonderful laws of the heavens and the nature of winds. In 1543, Blasco de Garay, a scientist and a captain in the Spanish navy, allegedly demonstrated before the Holy Roman Emperor, Charles V and a committee of high officials an invention he claimed could propel large ships in the absence of wind using an apparatus consisted of copper boiler and moving wheels on either side of the ship. This account was preserved by the royal Spanish archives at Simancas. It is proposed that de Garay used Hero's aeolipile and combined it with the technology used in Roman boats and late medieval galleys. Here, de Garay's invention introduced an innovation where the aeolipile had practical usage, which was to generate motion to the paddlewheels, demonstrating the feasibility of steam-driven boats. This claim was denied by Spanish authorities. Wikimedia Commons has media related to Aeolipile. ^ Hero (1899). "Pneumatika, Book II, Chapter XI". Herons von Alexandria Druckwerke und Automatentheater (in Greek and German). Wilhelm Schmidt (translator). Leipzig: B.G. Teubner. pp. 228–232. ^ "turbine." Encyclopædia Britannica. 2007. Encyclopædia Britannica Online. 18 July 2007 <http://www.britannica.com/eb/article-45691>. ^ Gruntman, Mike (2004). Blazing the Trail: The Early History of Spacecraft and Rocketry. Reston, VA: American Institute of Aeronautics and Astronautics, Inc. p. 1. ISBN 156347705X. ^ a b Kitsikopoulos, Harry (2015). Innovation and Technological Diffusion: An economic history of early steam engines. Oxon: Routledge. p. 5. ISBN 9781138948112. ^ a b Stone, Joe (2015). Floating Palaces of the Great Lakes: A History of Passenger Steamships on the Inland Seas. Ann Arbor: University of Michigan Press. p. 9. ISBN 9780472071753. ^ Museo Naval, Catálogo guia del Museo Naval de Madrid, IX edición, Madrid, 1945, page 128.